This pasta sauce is inspired by another of our own recipes, Pork Chops with Sun-dried Tomatoes and Capers and named after it’s creator. We feel the flavors of the sun-dried tomatoes and capers complement each other greatly while the rapini adds another dimension. *NOTE: If you find rapini or broccoli-rabe too bitter, we suggest you try to blanch the rapini before tossing it into the sauce. Use a splash of vinegar with a 1/4 tsp of Baking Soda in the boiling water used for blanching. 1. Prep tomatoes and other ingredients. 2. In a medium sized dutch oven, heat 2 tbsp olive oil and fry the pancetta. 3. When pancetta is browned, toss in the onions, garlic and the optional hot pepper flakes. 4. When the onions begin to show transparency and garlic softens, toss in the sun-dried tomatoes. 5. Let cook for a few minutes before adding the capers and the white wine. Allow to come to a boil, lower heat a bit and let simmer. 6. After allowing it to simmer for 5 minutes, add the chicken stock (1 cup at a time, allowing it to return to simmer) and bay leaves. 9. While cooking add the fresh basil along with some salt and pepper. 11. While letting the ‘sauce’ cook you can prepare the rapini. 12. Make the pasta, toss a ladle or two into the ‘sauce.’ When the pasta is done (al dente), drain and mix a bit of the sauce into the pasta, mix well. 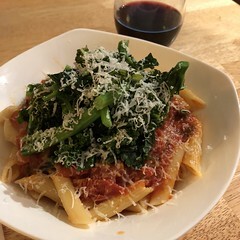 Serve pasta with sauce, rapini and some grated Pecorino Romano cheese on top.